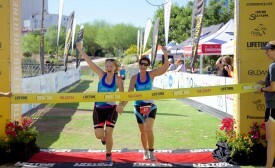 Tempe, Phx., April 25, 2016—Tempe-area women are invited to “Be Your Potential” at the Gildan Esprit de She Duathlon and 5K, the nation’s premiere race series for women, at Tempe Town Lake on Sunday, May 8. The event will feature a morning of fitness-inspired celebrations in picturesque Tempe Beach Park, benefitting Girls on the Run of Maricopa and Pinal Counties. All participants will enjoy a healthy pre-race breakfast catered by Café Boa in honor of Mother’s Day, followed by Gildan Esprit de She’s signature post-race Lifestyle Market featuring a Bubbly Bar with complimentary champagne, mimosas and wine. The fun and festivity continues at the Panasonic Beauty Bar powered by Life Spa where women will enjoy manicures, massages, or hair braiding and the souvenir photo booth hosted by The Vision Council. Tempe Beach Park, one of Arizona’s top recreational areas and the centerpiece of the Tempe community, will set the scene for the start and finish of the Gildan Esprit de She 5K run, sprint distance Duathlon and new international distance Duathlon courses. The 5K out and back run course will follow a loop on the shores of Tempe Town Lake, offering breathtaking views of Tempe and the lake. The duathlon course, mostly flat, loops around the city of Tempe. The sprint distance duathlon race course includes a 1.5 mile run, 12.4 mile bike, and 1.69 mile run and the international duathlon race will offer a more challenging journey during a 3.1 mile run, 24.16 mile bike and, 3.1 mile run. Tucked between downtown Tempe and the shores of Tempe Town Lake, Tempe Beach Park offers the ideal location to help all participants race to beat the desert heat. As the official charity partner of Gildan Esprit de She since its inception four years ago, Girls on the Run inspires girls to be joyful, healthy and confident using a fun, experience-based curriculum that creatively integrates running. The mission of Girls on the Run aligns in strong parallel with Gildan Esprit de She; helping women of all ages lead confident and joyful lives. During registration, athletes will have the opportunity to donate to Girls on the Run and are invited to become a coach or volunteer. To learn more about the local Girls on the Run of Maricopa and Pinal Counties visit www.gotrmc.org. All registrants will receive many fashionable freebies including an official Moxie Cycling Jersey ($69 value) for the duathlon or an MPG performance tank ($40 value) for the 5K run, reusable gift bag branded with the 2016 annual series theme Be Your Potential, finisher’s medal with removable charm, and free post-race photos courtesy of The Vision Council and more. Be sure to follow Gildan Esprit de She on Twitter @EspritdeShe and Instagram @EspritdeShe, and like the series on Facebook at www.facebook.com/EspritdeShe. Produced by Life TimeSM – The Healthy Way of Life Company, with five fitness clubs in Tempe and its surrounding cities, Gildan Esprit de She is well known for its signature Thursday night fitness-inspired “happy hour” 5K/10K runs and continues to grow in popularity for its appeal to athletes of every pace and passion. Visit www.espritdeshe.com for more information. Life Time is a privately held, comprehensive health and lifestyle company that offers a personalized and scientific approach to long-term health and wellness. Through its portfolio of distinctive resort-like destinations, athletic events and corporate health services, the Healthy Way of Life Company helps members achieve their goals everyday with the support of a team of dedicated professionals and an array of proprietary health assessments. As of March 2016 the company operates 119 centers in 26 states and 35 major markets under the LIFE TIME FITNESS® and LIFE TIME ATHLETIC® brands in the United States and Canada. Additional information is available at www.lifetimefitness.com.